MUMBAI: In an industry first, electronic dance music DJ-producer Marshmello and Bollywood’s most sought after music-composer Pritam have released BIBA today, a collaborative track. As the latest release from Artist Originals (AO), JioSaavn’s in-house music label for independent artists, BIBA is Marshmello and Pritam’s first project together. BIBA, which is now live for streaming worldwide, represents an increasingly multicultural music industry that weaves together genres, languages and starpower across borders. The uplifting, romantic track combines the pure emotion and joy of Bollywood with Marshmello’s world-class contemporary production that fills stadiums and festival-grounds around the world. The track also features Indo-Kiwi artist and Youtube phenomenon Shirley Setia. Marshmello, who has more than 20 million combined social media followers, has consistently landed at the top of global dance charts since his 2016 breakout single, Alone, the video for which is at 1 billion views on YouTube. His latest smash hit single Happier with Bastille topped the charts around the world, with cumulative streams nearing one billion. His signature chilled out vibe, undeniable talent and mysterious profile earned him No. 5 on U.S. dance charts for his album Joytime, climbing to number one in 2018 with Joytime. “I went to India for the first time ever a few years ago and I had no clue how much it would change me. The amount of love, strength and compassion the people of India have is remarkable. I’ve never been somewhere where I felt so appreciated and loved by so many and from that moment on it became one of my favorite places and I always wanted to do something for the culture,” Marshmello stated. “When I connected with Pritam, I told him we have to do something fun together, something that makes you want to get up and dance and I think Biba is perfectly that. I’m excited for the world to hear it,” he added. Entirely in Hindi, BIBA could be viewed as Marshmello’s most directly cross-cultural project to date. His collaborator is Bollywood’s most successful composer, having scored music for more than 100 Indian films. And with an understanding of popular music, JioSaavn saw Pritam as a natural fit for the track. For BIBA, Pritam experimented with genres and created completely new sounds. 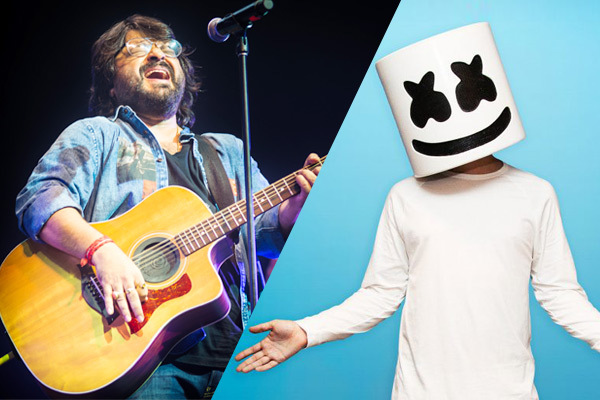 Pritam added, "Marshmello's team and I wanted to collaborate on music that would be very popular and still retain that Indian sound, something that could play at weddings. I enjoyed working on 'BIBA' with him and the experience allowed me to see why he is the biggest music producer." Pritam’s new track with Marshmello is powered by AO. The genesis of the collaboration came through JioSaavn COO Gaurav Sharma, and represents the significant role JioSaavn continues to play in bridging the Western and Indian music industries. Previously, JioSaavn facilitated a viral Dillon Francis remix of the 2017 AO hit Bom Diggy by Zack Knight and Jasmin Walia. When Sharma and Shalizi met in 2018, plans were already underway to leverage JioSaavn’s platform and user base to elevate Indian culture and music across the globe. With Marshmello looking for new ways to engage with his global fans, Sharma and Shalizi quickly saw an opportunity to align. “When I first met Moe, he told me he grew up in a house that had Devdas and SRK (Shahrukh Khan) movies playing all day. Music is an incredible way for cultures to connect and find common ground, and that was really the genesis of all of this. Mello wanted to make music that was authentic to India for the millions of fans he had here. He wanted to be part of the culture - not just feature in it, and that meant a lot to us,” JioSaavn COO Gaurav Sharma, said about the release. “Music in India is evolving - it’s taking more risks, it’s becoming more artist driven, and it’s becoming more international. BIBA represents all of that. For JioSaavn, we’re going to continue to be the platform for both Indian and International artists to build, collaborate, succeed, and bring our culture to the global stage. This is just the beginning,” he further added. Stay tuned for the forthcoming music video for BIBA, which will be directed by superstar filmmaker, Punit Malhotra. The director will also be releasing one of the most anticipated films of 2019, Student of the Year 2 in May. As part of the collaboration, Marshmello will perform select shows in India. Fans can catch him at Supersonic Arena in Hyderabad (15 February 2019); Huda Grounds in New Delhi (16 February 2019); and Supersonic Festival in Pune (17 February 2019). Top Indian electronic act and fellow AO artists, Lost Stories, will be joining Marshmello for the mini-tour. Meanwhile, Marshmello is currently nominated for six iHeartRadio Music Awards, including Best New Pop Artist, Best Dance Artist, and Best Producer. Marshmello won his first American Music Award for “Best Electronic Artist” at the 2018 AMA's and a 2018 MTV EMA Award for Best Electronic Artist. Slated to be one of the highest-earning DJs in 2019, Marshmello graced the cover of the 2018 Forbes 30 Under 30 issue. Forbes included his manager Moe Shalizi on the list and called Marshmello - infinitely scalable.